Back in the day I remember the bomber jacket all too well. It was a lot bigger than it is now and although I didn't really like it back then, I kinda do now. I like the new streamlined version and I think it's a lot more wearable. I don't know if that's the right word but what I mean is that you can dress it up or just keep it casual, without looking tacky. I've gone for the Rick Owens bomber jacket with the brushed leather and contrasting sleeves. I think a little bit of texture can do wonders for an outfit and so I've teamed it with another must have for this Spring. 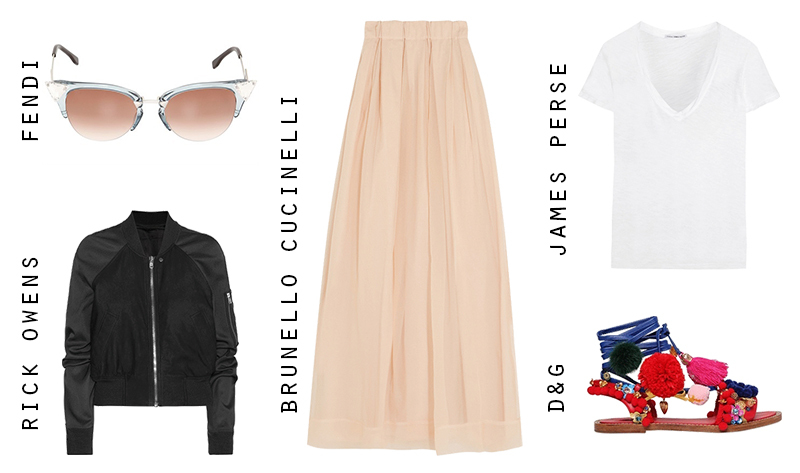 It's this beautiful pleated maxi skirt by Brunello Cucinelli. What I love about these pleats is that they're not too structured so you can go for the laid back look without looking like you're trying too hard. Paired with a customary white t-shirt slightly tucked in, with a little bit hanging out this outfit just gets better and better! I chose the James Perse t-shirt just because I like the slouchy cut and it's not bright white either. What can I say about those sandals by D&G! Don't they look just amazing with the tassels and pom poms? They add that perfect pop of colour to this look and there's nothing more to say. Just look at them! And finally to finish off, a pair of cat eye Fendi sunglasses to compliment this casual but super stylish look. What do you think? Would you wear this outfit and how would you style a bomber jacket?